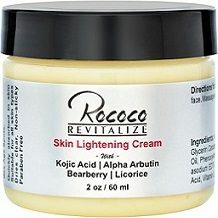 This product review provides details about a product called Rococo Skin Lightening Cream. This product is designed to get rid of persistent areas of darkened skin on the face and other affected areas of the skin which occur due to age and sun exposure. This helps to create an even skin tone. It also contains some skin bleaching ingredients to give skin a lighter tone. It can be used on all skin types. A number of the ingredients listed in this product are essentially there to provide nourishment for the skin cells. Examples of these are all the vitamins that are listed and the fatty acids like alpha lipoic acid. The fatty acids have another advantage which is that they lock in moisture and prevent it from leaving the skin cells so that the skin does not dehydrate and wrinkle. The vitamins as well as coenzyme Q10 also act as antioxidants which means they reduce the amount of chemical damage that the skin cells experience. The alpha arbutin is able to reduce the production of melanin in the skin cells so that they do not produce as much pigment. This is what helps to reduce the appearance of dark spots. The kojic acid is also an antioxidant but has natural skin lightening properties. The manufacturer suggests washing the face before applying the product. A thin layer of Rococo Skin Lightening Cream must be applied by massaging it in a circular and upward motion on the whole face and neck twice a day. There are two pricing options for this product. 1 oz of this product will cost $14.90 and 2 oz will cost $24.90. The prices include the cost of delivery for all customers within the United States of America. We couldn’t find any bulk order options which we have seen in other manufacturers. Often bulk orders come with large discounts. There is also no evidence of a subscription for a regular order for this product. There is no satisfaction guarantee on this product but customers may return items that have not been opened within 30 days from when they received their order. This returns policy is of no use to customers who have opened the product and tried it and then found that they are unhappy with the results. When a manufacturer offers a satisfaction guarantee, it signifies that they are so confident that the product will work that they do not want customers to pay for it if it doesn’t. The opposite is true in cases like this when manufacturers don’t offer a guarantee.